So after all the excitement of the cricket in South Africa, and as England struggle to win the 4th test in Port Elizabeth, I must return my attention to my running training. As most amateur marathon runners know, 18 weeks is an ideal amount of time to run a marathon. Unfortunately I am going to have to stick to a hasty 15 weeks preparation as my broken wrist is hampering my running somewhat. Running or training intensely at any pace is quite difficult, partly because the good people at Truro Hospital in Cornwall, and at St Thomas’s in London, have set my wrist at an awkward angle for me to have any dexterity. The cast gets uncomfortable sweaty when doing high intensity training on a bike or treadmill, and the awkwardness of the cast means I have to hold my arm in to keep it as still as possible – so best laid advice has been to withhold from the running until it is out of cast as it may cause me to run off centre and generate niggling injuries! Role on 2nd February when hopefully the cast comes off…it is becoming quite boring having it on. Although it does get me out of doing press ups or pull ups! Although wearing a training weighted vest with 28kgs in it and pulling a weighted sledge up and down is not affected by it – thanks Jon. Anyways, I am confident that 15 weeks is going to be sufficient to lug myself around the London Marathon course in April. Speaking of which I can now alert you all to the details of my fundraising page for the London Marathon. I am running the London Marathon 2016 in memory of my darling Daddy, Robin Halfhead and raising money for a wonderful charity called Maggie’s. Maggie’s Centres helped my mother and father during my father’s battle with cancer. The Maggie’s Centre in Oxford was a place they felt they could go to after they had been to one of my father’s consultations with his consultant and be given reassurance, advice, comfort and where they felt treated as individuals going through the cancer journey and not just another old couple where my dad was just another man with cancer facing a battle he couldn’t win. They treated my parents with respect, and listened to them and answered their questions in a way that my parents could understand, and they treated them as old friends. There was always a cup of tea and coffee, and homemade cakes and a friendly face to greet them. Everyone going through cancer would benefit from visiting a Maggie’s Centre, they help you feel less frightened, less lonely, and able to share what you are going through. They are run by volunteers, but are so well equipped and run by such wonderful people and they really make a difference. If you can help me raise money for them, specifically for Maggie’s Centre in Oxford I would be so grateful. They really helped my parents, and I know they can continue to help so many more people. And there we have it…weather saves the day! 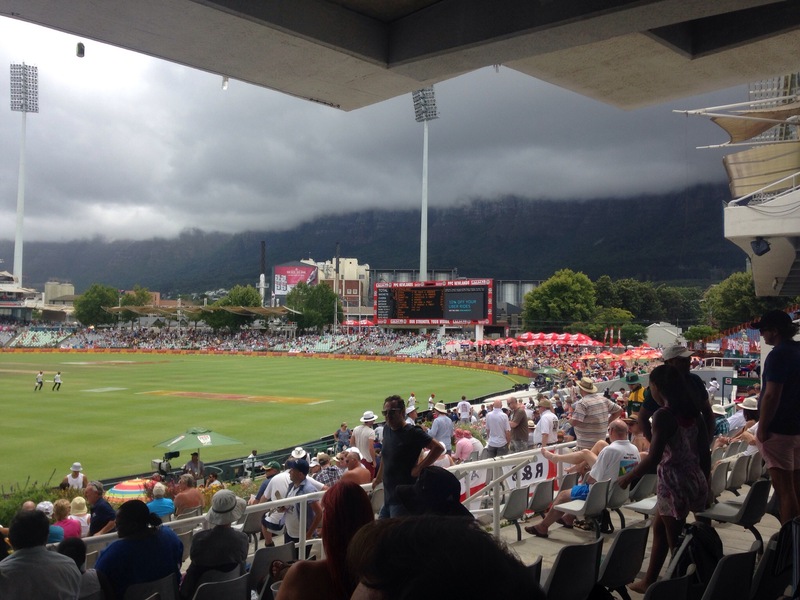 Day 5 at Newlands….cloudy! Not a good foreboding it has to be said. If it had just been me, I would have said that the bright blue sky that seemed in greater abundance than the clouds that were loitering around Table Mountain and overhead would prevail….but I was with Rachael & Aulden and they know Newlands weather and that it has a whole weather system separate to the rest of Cape Town, all to itself. They do say that it can be clear blue skies over in Greenpoint, but over the other side of the mountain in Newlands, cold, windy and raining. I’m optimistic, to me the clouds meant that there might be some swing, and I secretly believed what Aulden told me yesterday, that 20 wickets could fall on a 5th day at Newlands. And I still believe it to be true – damn the pesky light failing and the rain! And the sky was cloudy which Ihave to say made me feel secretly confident – I feel that Anderson would have brought some swing into his attack which might have seen those South African wickets tumble…but sadly we will never know! Underneath those white clouds and blue sky it was deceptively warm and we settle down to the morning session. Yes, I was disappointed when Cook went and subsequently Hales but not rattled. In my head we wanted to eventually lose all of our wickets, for a reasonably chaseable total – I mean who doesn’t want to see a test match go to the wire, it may not be in the players interests or intent, but as the baying crowd, we wanted some knife edge entertainment – well I certainly did. As for the Barmy Army, they sang their daily rendition of Jerusalem, and to be fairly honest after that we barely heard a peep out of them, and today were sitting almost on top of them. Yes, as the English wickets began to tumble a little too quickly it was a tad tense in the north stand on row X, seats 55-58. But it was all good banter. 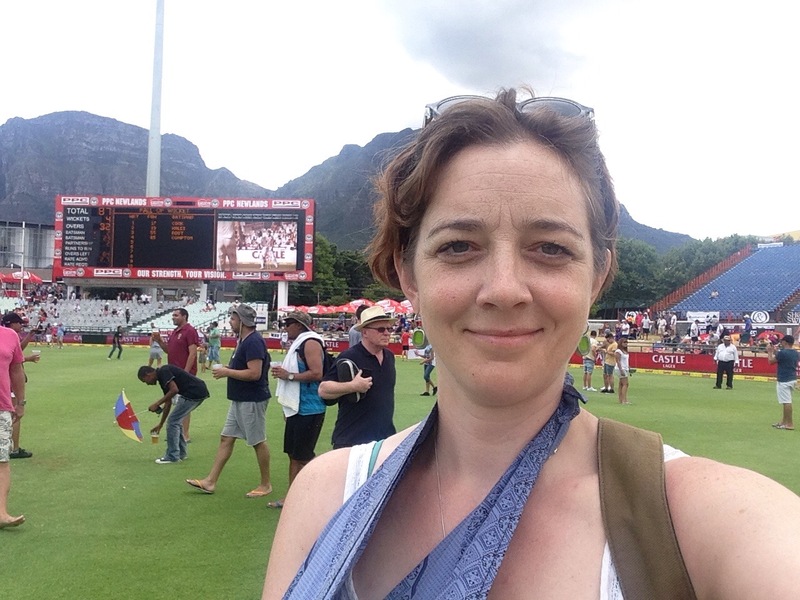 The wickets tumbled a little too freely as South Africa held onto some quite spectacular catches and it seemed that Morris could do no wrong, catching, bowling! 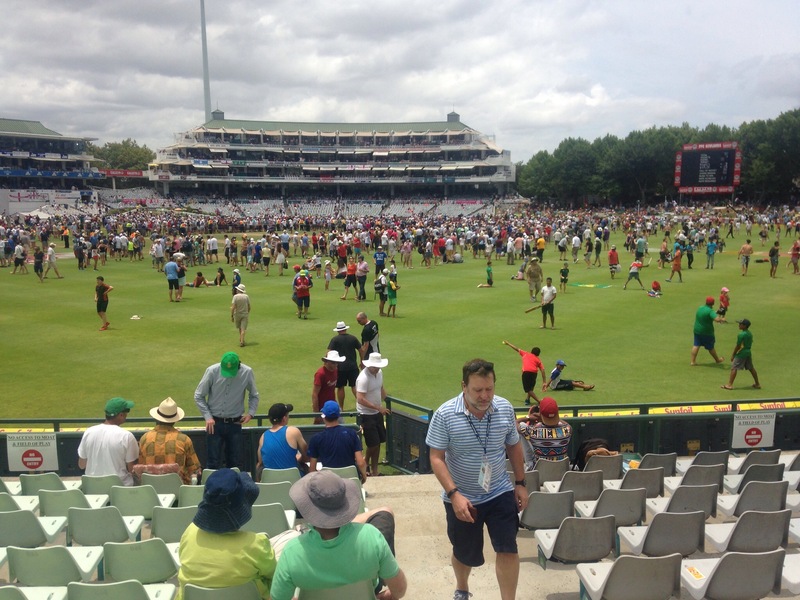 Respite came in the form of the lunch break where we were again permitted onto the lunch grass of Newlands – it really is so very green and flat, you have to hand it to the groundsmen for their fastidious work. As we crossed the ground, heading to the tastier local beer tent selling decent beer as opposed to the Castle Lager, I did get side tracked by spotting Botham getting ready for the lunch break Sky sports analysis. I dived through the crowed and simply asked him as he sat on a speaker looking at his phone if he’d sign my cast. I think if I hadn’t had my arm in plaster he might have said no, but it does work wonders, and as he signed it I did say thank you and told him that my dad thought he was a legend! And actually if you squint his signature does look a bit like “Beefy”! Still ever the optimist I simply felt that this would aid our fast bowlers when the time came, and hoped that we would be bowled out by about 130-150, or if to Cook would declare and stick the Proteas in to make a meaty finish of it! I could but dream and I am sure that Aggers and the rest of BBCtms probably thought differently. 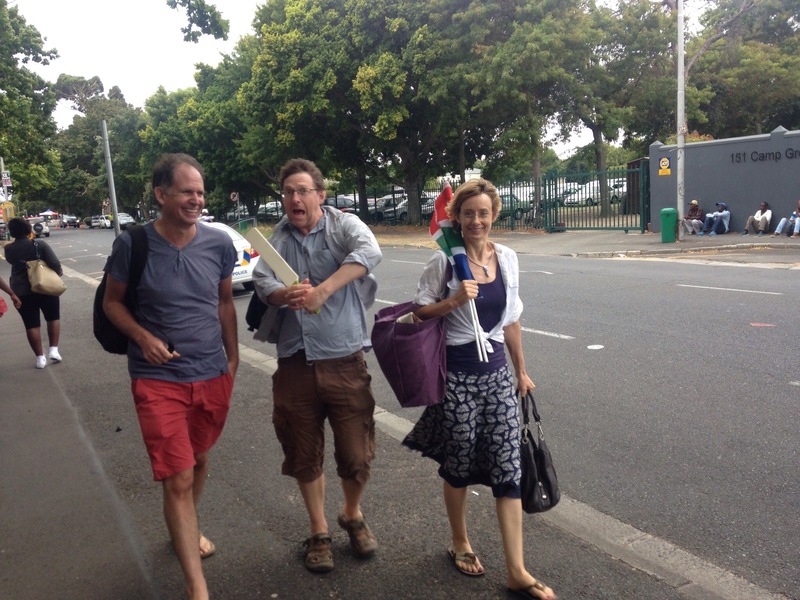 Meanwhile Aulden, Sean & Rachael were concerned that England were beginning to post to high a target for the Proteas to chase! Ooooh the tension! At the end of tea the raincover was dragged onto the wicket, and the almost a minute later taken off and the players came back out, for all of about 2 overs when they went off for bad light – it was very gloomy. 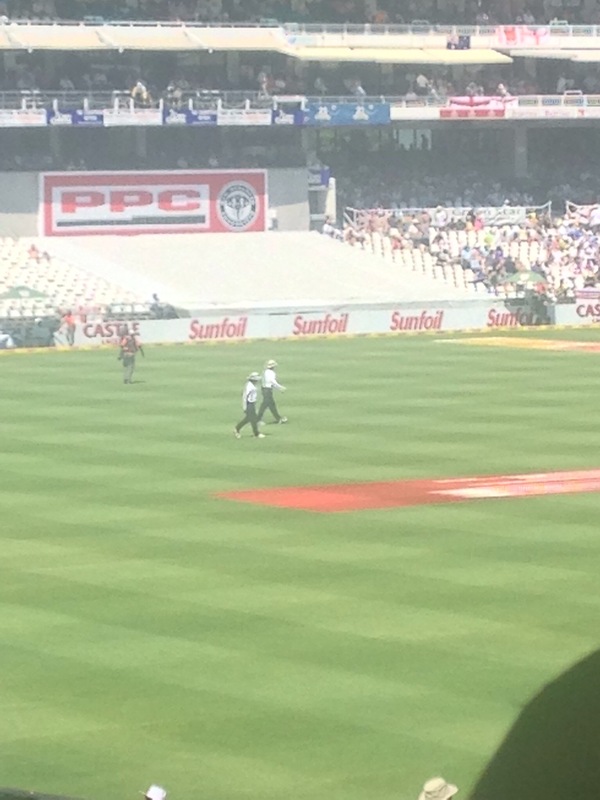 The notice posted on the scoreboard informed us that the umpires would review the situation periodically – hmmm. Here I bowed to greater knowledge. It was cold and windy, the decision couldn’t officially be made until 5pm to call the inevitable draw that we all know was coming, and as that was still quite some time away our party left as many others were doing. It has been a quite magnificent 5 days of cricket which has been full of everything a cricket fan could wish for, except perhaps for all those dropped catches – would they have changed the result, we’ll never know. 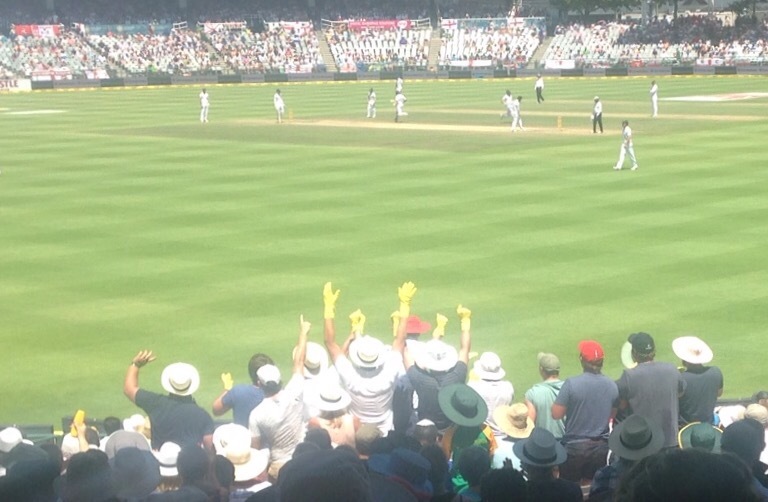 Double centuries, maiden centuries, highest scores, partnerships, fastest 250s, longest in the field, beer, carrot sticks, dried mango, nuts, droervors, biltong, sunburnt bodies, too much flesh, drunken singing, autographs, Barmy Army, Hashim Army, Panama hats everywhere, snack sellers, the smell of hot dogs and deep fried food, it’s been an absolute blast. I’ve loved it, and I know my dad would have loved it too. 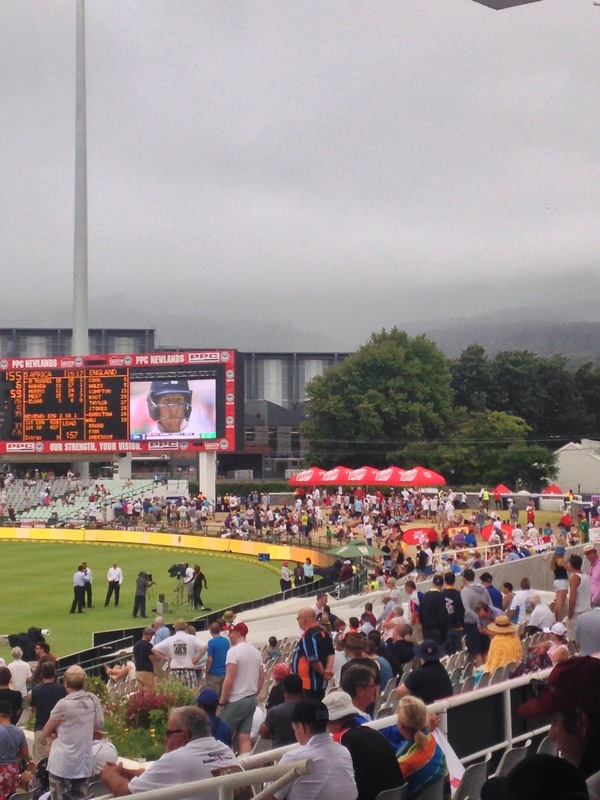 A shame about the weather decided result – but hey, That’s Cricket!! Someone tell England – catches win matches!!! In fact it is likely that is was dress up day, as there were quite a lot of fancy dress groups around the ground – some definitely more tasteful and wiser than others considering the heat today. We saw a Thomas the tank engine, someone in a full length wig (presumably Captain Caveman – it was a tad hard to tell), men in parasols sporting tutus and creepy masks, a man dressed as a full grown baby, a pint of beer, Snow White (I think! ), and many more. In the next photo, they are some of the fancy dressed group giving their all back to the Hashim Army! The Barmy Army started commenced proceedings with a good and tuneful rendition of Jerusalem, and then proceeded to serenade the bowlers: Anderson, Broad, Finn and they also sang to Bairstow. But it was hot this morning and very humid, and both armies fizzled out abit with the slow cricket that was also taking place. 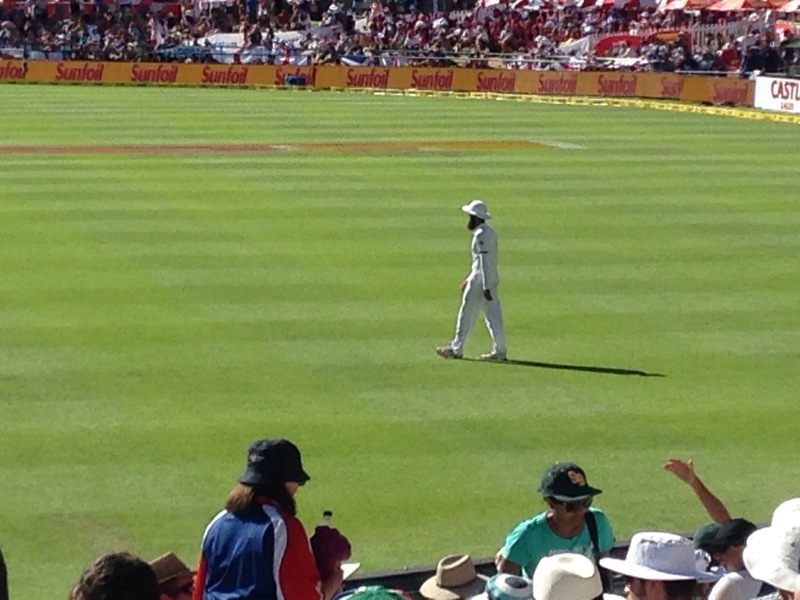 Hashim Amla’s double century was really the only thing that lifted us out of our seats during the morning. 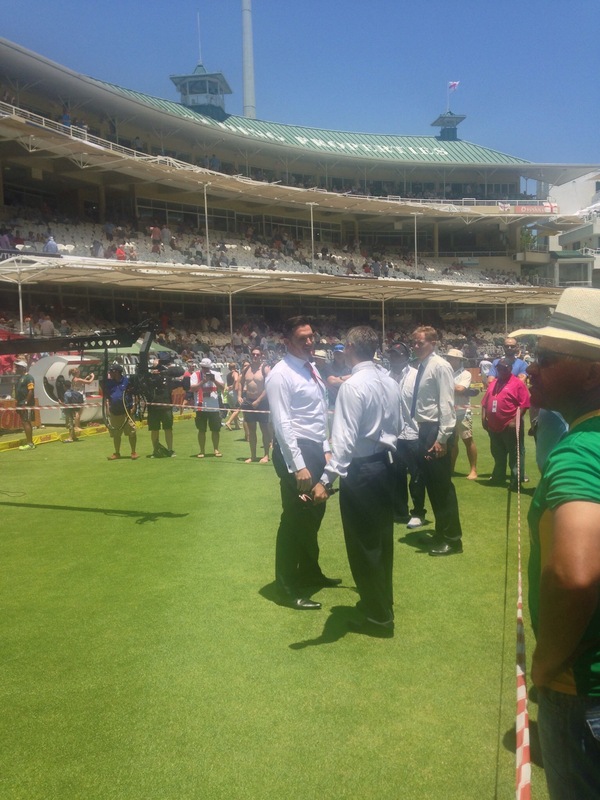 I couldn’t even go and try and get more autographs as firstly we were in the middle of a row so it was a bit awkward, and also, I already have Moen Ali’s, and he was on our boundary most of the time. Still the lunhbreak came, and this time a whole load of school children went onto the pitch to have cricket practice which was quite fun for them. 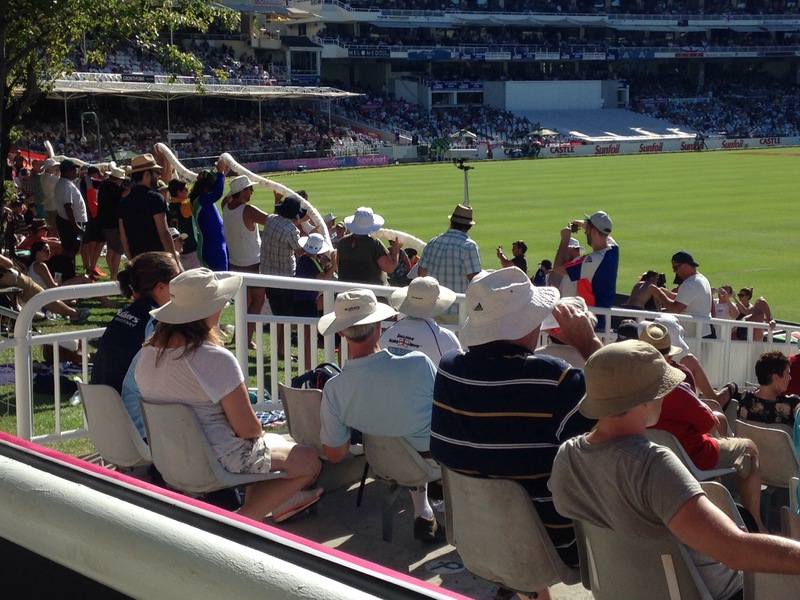 I think most members of the crowd took this opportunity to imbibe of the beer, as after lunch the mood definitely picked up, especially of course when Amla was bowled by Broad…if you can’t catch them out then you have to bowl them out. With du Plessis following shortly afterwards, the mood in the crowd definitely improved and the chanting began and to be honest didn’t let up – at one point it was difficult to concentrate on the actual matter in hand, that being the cricket. Although, whenever we were able to concentrate on the cricket it seemed to be when England was either dropping a catch or letting a ball shoot through beyond the fielder’s grasp…I’m not sure that shoddy is the word I would use, but it was hard to not mock. And then there was the quite magnificent maiden century of Bavuma. Quite ridiculous – and he gave a lot of cause to the Hashim Army to grow ever louder, aided at appropriate intervals by a South African in the row in front of us who every so often simply bellowed in a very loud deep resonant voice BAVUUUUUUUUMA. Sean, sitting next to me tried to imitate it, but wasn’t quite as effective. His century was fantastic, even though he doesn’t look quite big enough to hold the bat, he runs darned quick between the wickets. What a privilege to watch his maiden century and for it to be such a historic one. If nothing else this test has been one of records broken and achieved which as my brother says has given me lots of “I was there moments”. So to the 5th day tomorrow. If we’d only held onto a couple of catches, then who knows what it would look like. It’s made the 5th day though full of twists and turns, and while some of the cricket hasn’t been the best advert for 5 Day Test Cricket perhaps due to an incredibly flat bland wicket, my goodness some of it has, and it’s been the best batting I think I may ever see. Still, there is room for some more ups and downs tomorrow that is for sure, and I hope both armies will be in full song, I have a feeling our tickets might be quite close to them. 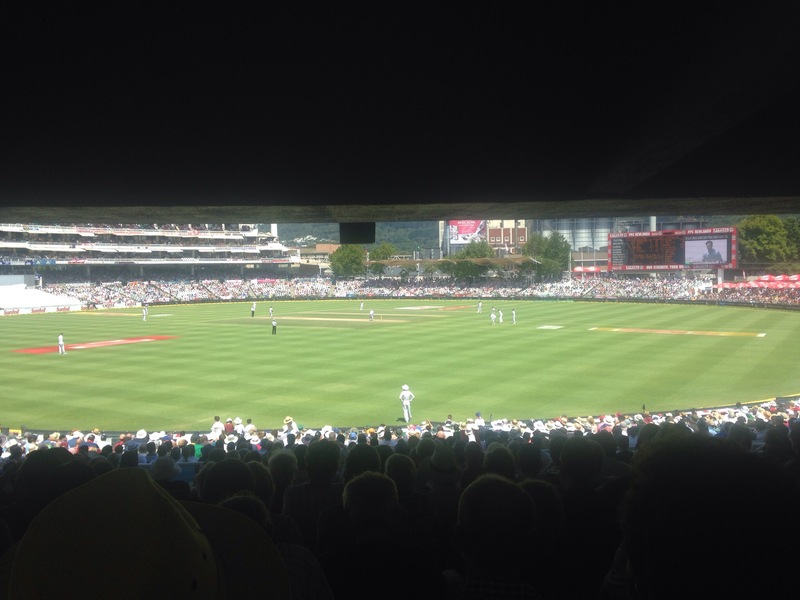 Today’s view at Newlands meant that we were in the blissful shade all day today – in acting terms we were sitting in the gods, but it was light and breezy up there with a good view of the field. What were we hoping for today….hmmm, well certainly for South Africa to avoid the follow on…and are it to Day 4. well, they’ve certainly made it to Day 4…perhaps without the scintillating cricket that we saw yesterday, you have to hand it to Hashim Amla, although he took all day to reach his so far unbeaten 157, he was literally there all day! I mean, he shouldn’t have got there…after all we all know that catches win matches…don’t we? And quite frankly the last hour of play, well it wasn’t really play…the bowlers took ages with each over, the batsmen weren’t really hitting any runs, and even the umpires seemed to faffing about doing goodness knows what in the final 3 overs. Most of the crowd were diehards and hung on either hoping for a sneaky late wicket, or some imitation of yesterday’s batting display hitting all over the place… Maybe it was because it was Day 3 and the Barmy Amry were frazzled from two days in the heat, but they definitely weren’t in full voice today. After an initial start in the morning they seemed to fizzle out – of energy…due to sunshine/too much beer from the last couple of days…who knows…but it is a shame that Newlands bans musical instruments cos we could have done with the Barmy Army’s trumpet keeping the flagging energy up, and not least the players. The field filling up during the lunch break. And it seemed too good an opportunity to miss, surely one of them would sign my cast. When the broadcast was over there were swarms of kids with miniature bats pushing for Smith to sign them – I’m afraid, and I’m not proud, but I used my height and my temporary disability to my advantage and as Smith had a pen in hand I just shoved my arm in front of him (like a miniature cricket bat), he initially looked surprised but then smiled and raised his eyebrows and signed away! To be fair to the others, they all look like I signed their names myself, or not far from many of the doctors signatures I have witnessed over time…but they are all genuine I promise. 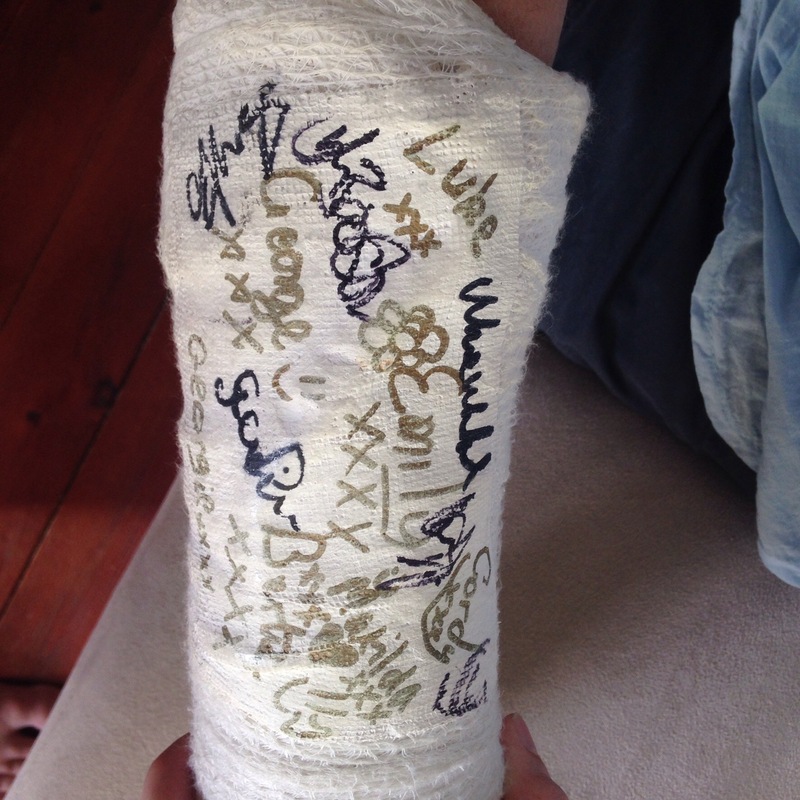 Apparently my challenge is to get the “Weasley Twins” to sign my cast (Stokes & Bairstow), set by my brother! In our seats in the gods we met an interesting Australian (talked a lot to the point where you felt you might miss the odd ball – but given the pace of the cricket this didn’t matter too much), an entertaining fella from Birkhamstead – he was akin to a slightly younger and drinker version of Boycott, but when he witnessed me carrying two pints of beer (a balancing act with my cast), and found out that I was a nurse he swore I had wings and was an angel!!! What can I say to that? And next to him was his friend who we couldn’t quite wor out where he lived…Malawi, South Africa, somewhere in the region anyways. Although the cricket decidedly dragged at times, and we still don’t know what the final referral was for, it just seemed like both teams & umpires were willing the last over and wasting time to get there, we still had a fantastic time, as the winds in Newlands picked up and clouds poured down off Table Mountain (hopefully bringing a change which might suggest a hint of swing for Mr Anderson tomorrow) we hung on clapping each run and cheering at the end and slowly made our way home back to Greenpoint, where there are no clouds and only heat and humidity. We’ve dined at a delicious seafood restaurant down in the port, Panama Jacks – fresh calamari and langoustine from Mozambique -YUM! 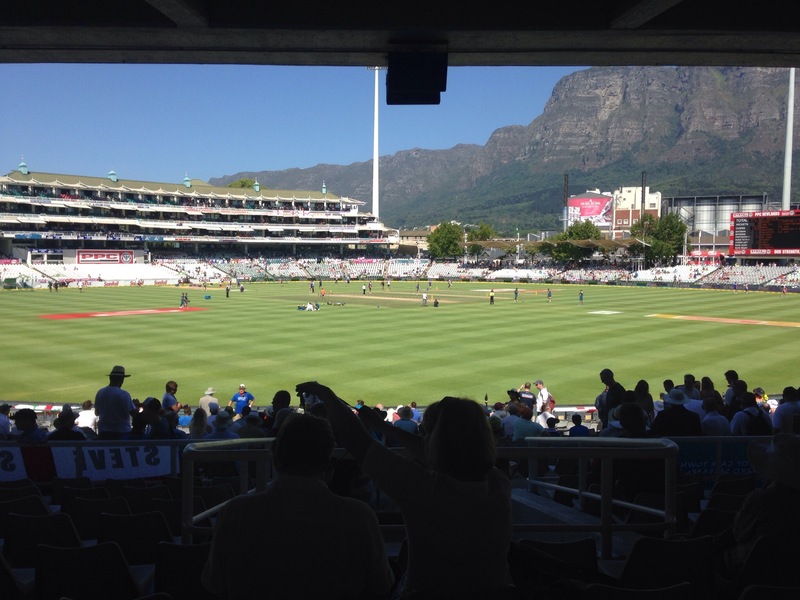 So all left for me to say is, whilst some might be thinking it’s heading to a draw or a dead end…my daddy would say (from the best seat in the house where he is watching) “It’s a five day test, anything can happen”. 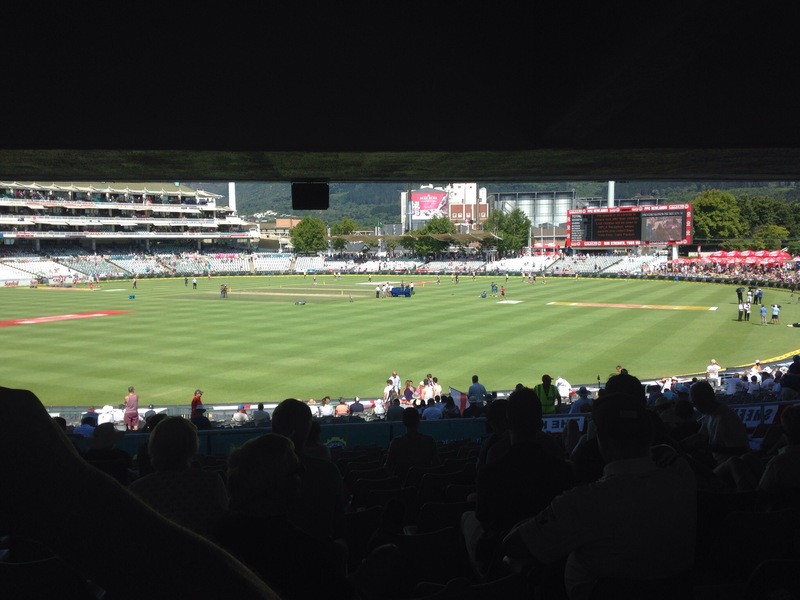 And I will pray for rain overnight at Newlands to bring some swing! 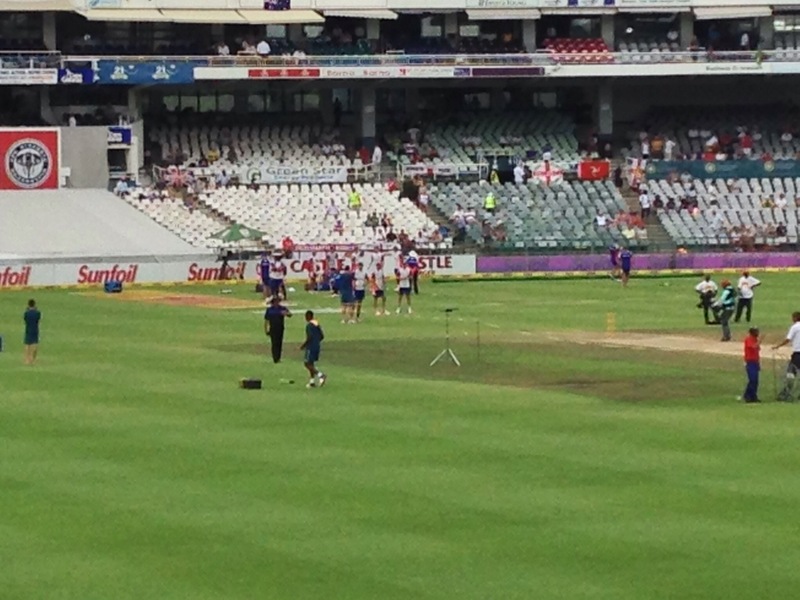 The Proteas warming up before play. Wow- words almost simply do not do enough. 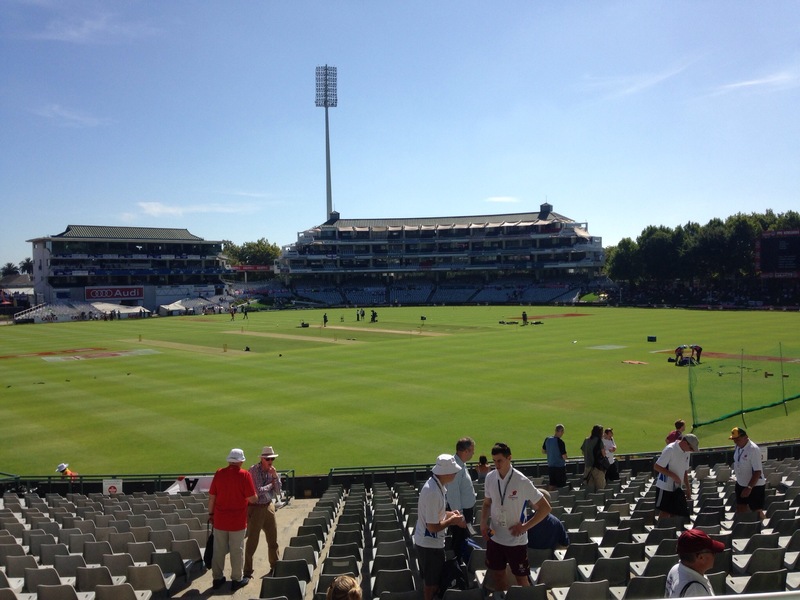 There we were turning up at the beautiful Newlands ground at about 9.15am in the bright and already hot Cape Town sunshine, and I was secretly optimistic that we would make 400 runs but possibly with the loss of a 2 or 3 wickets. My fellow cricket friends here in Cape Town I believe were having thoughts of wickets tumbling and a total of at most 400 being reached. How wrong we all were. I think by lunchtime I had stood up to cheer the announcements of 50 run partnership, 150 runs, 100 run partnership etc so many times I was hot from the exercise and not the heat. 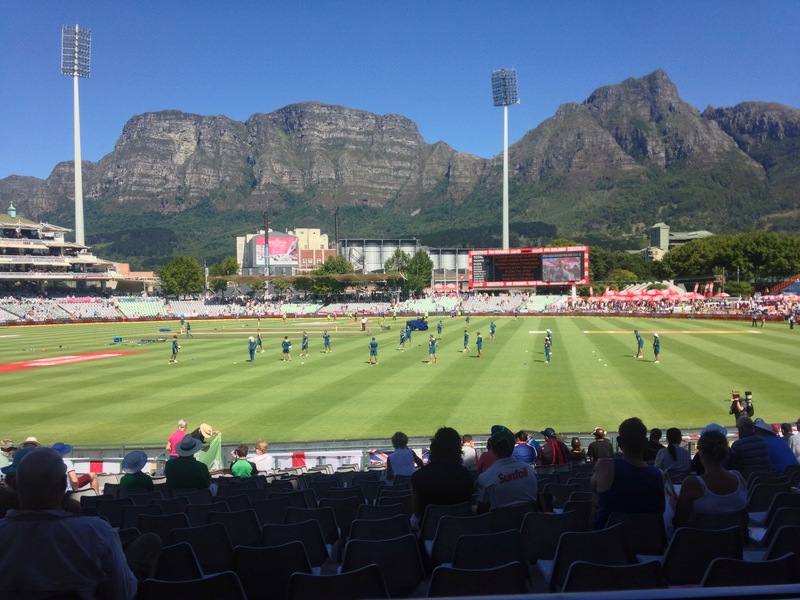 Once again we thanks to Aulden we had fantastic seats in the front row of a block in the North Stand right opposite the main scoreboard with a breathtaking views of Table Mountain behind. 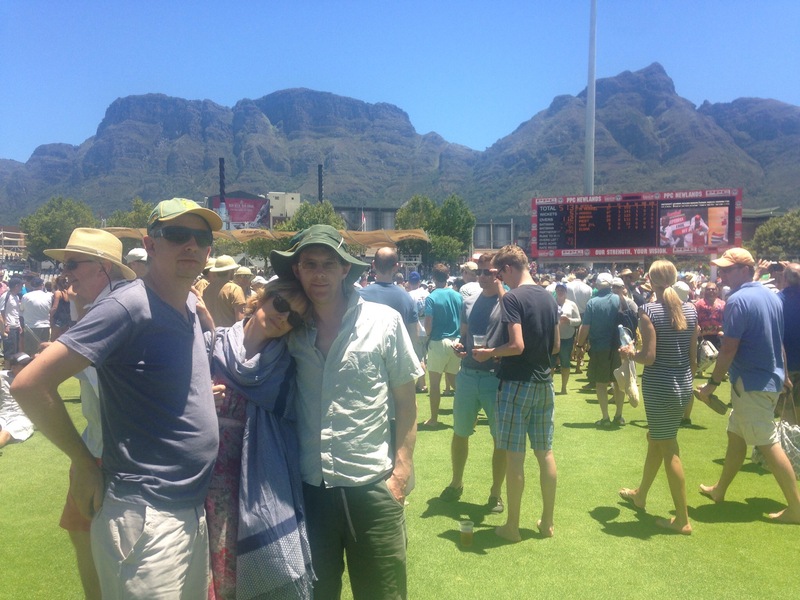 This was a great place for watching the cricket, also because the sun didn’t really hit our seats until about 2pm, and because once again we were surrounded by wonderful atmosphere. To our right about 2 blocks was a group of Saffers, all dressed up as Hashim Amla and they were in as good voice if not better as the Barmy Army who seem to be scattered throughout the whole ground. And watching Stokes and Bairstow clobber that ball all over and at one point all over the ground was one of the finest mornings cricket I have ever watched, and what a privilege to witness it live ball by ball. 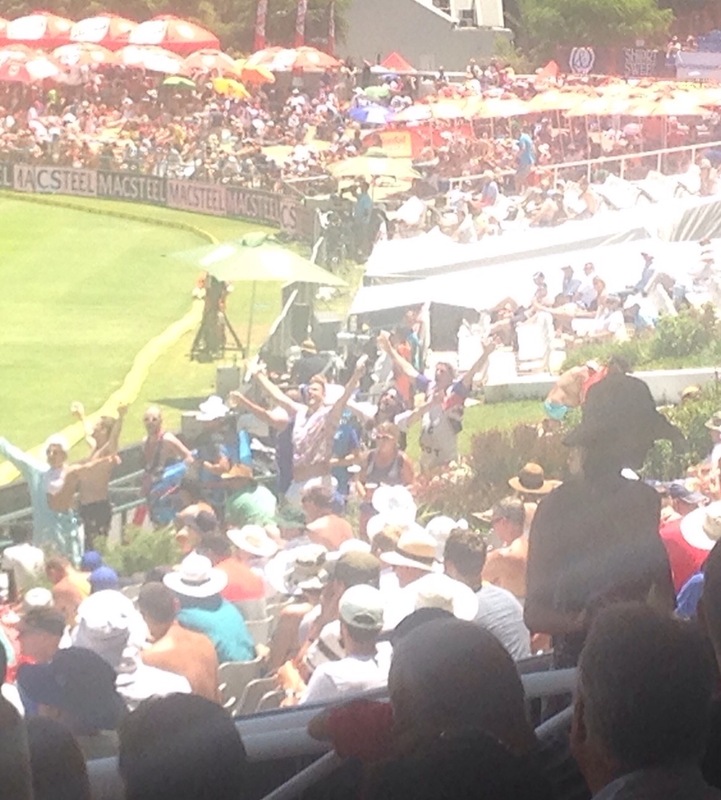 I think the highlight for me was actually when Bairstow hit his maiden century – just fantastic to watch his reaction. 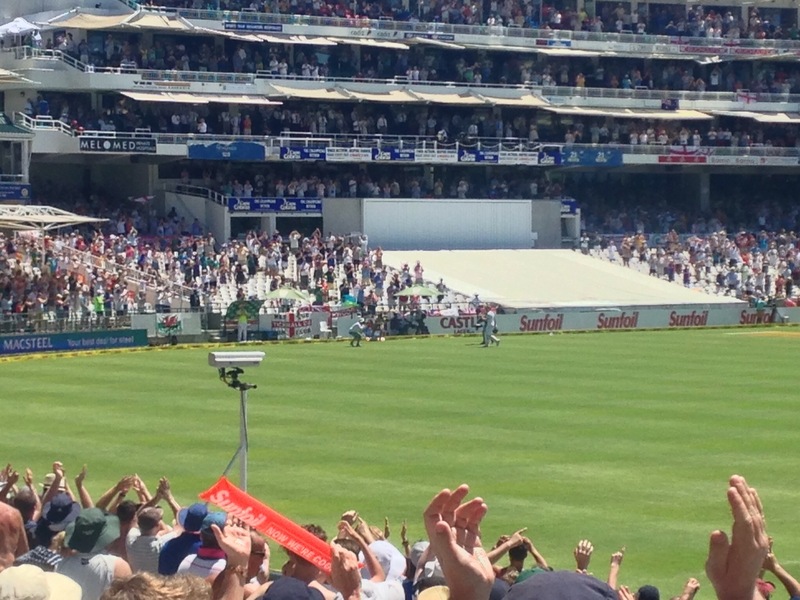 Stokes walking off at the end of his historic innings. 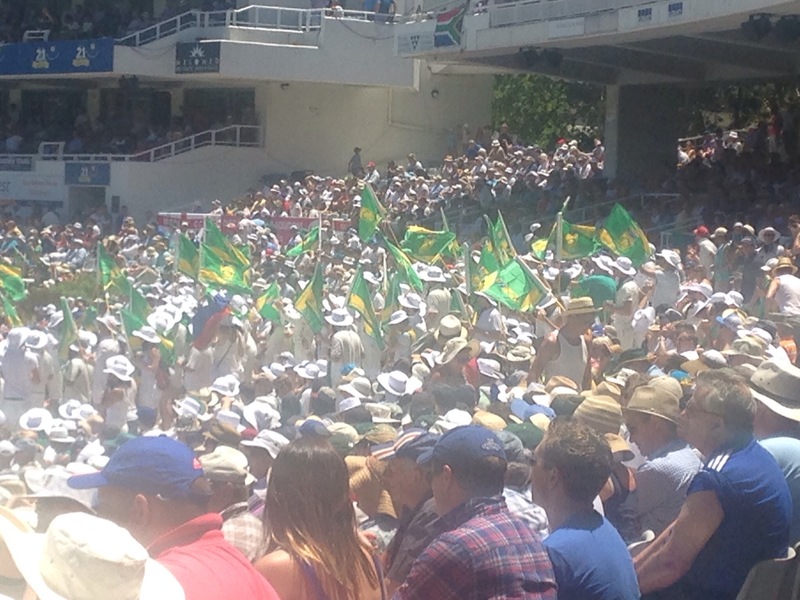 big respect though goes to the Amla Army as I shall call them – whilst none of us can get their chanting out of out heads, they kept up pretty much none stop throughout most of the day, especially after tea when Moen Ali was bowling and Amla was batting, I don’t think they paused for breath. I hope my video which I shall attempt to post, of them does some justice. They worked hard in the heat almost as much as the players! Moeen Ali above, and the Hashim Amla Army below! 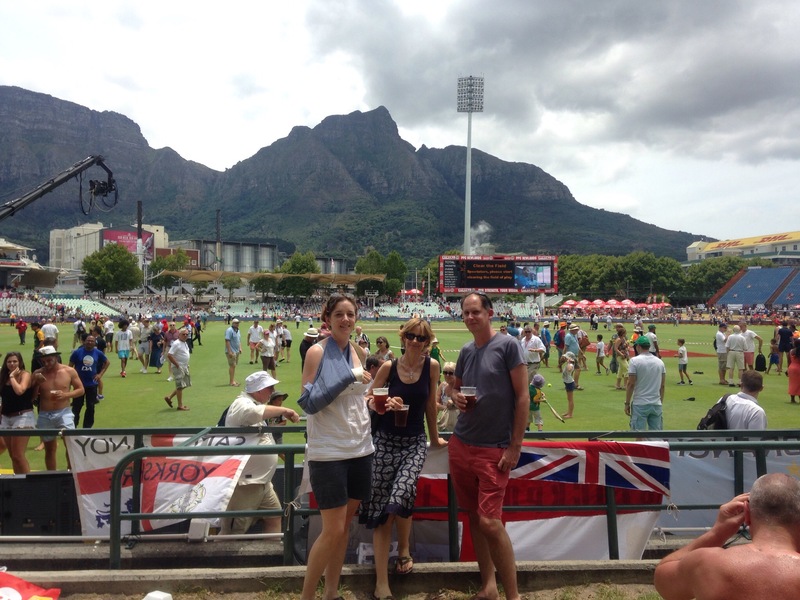 There were beer glass snakes, songs sung at Moen Ali & Hashim Amla, beer drunk, spilt, crowd banter, sun cream on some, and not on others, again a a lot of flesh on display – everywhere! There is biltong & droervorse, ice creams, face painting, cold drinks and crisps sold by friendly vendors who sell their wares constantly throughout the day walking through the crowd, oddly they also sell donuts,which are covered in thick icing and look like the last thing I would imagine anyone wanting to eat in such heat – but what do I know….they get sold. 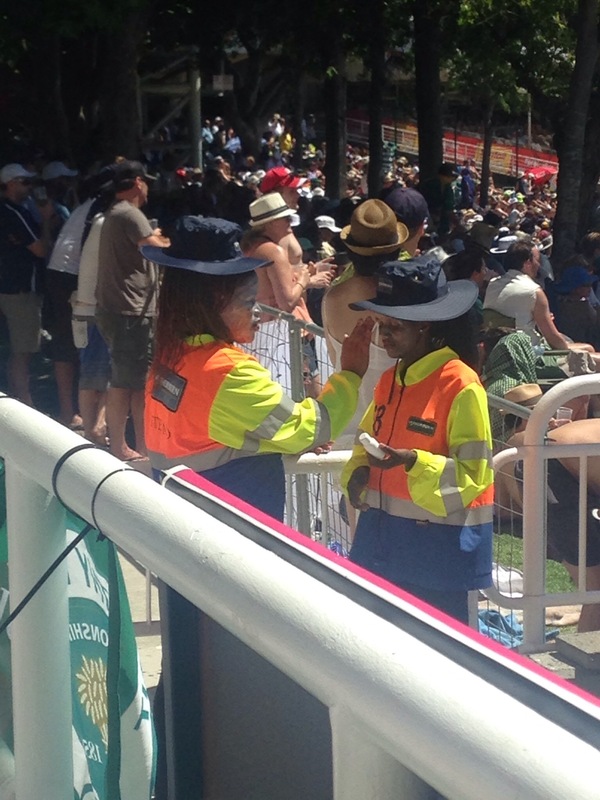 Two ticket guards making sure they don’t burn!!! I worry more about 1 or 2 people on display in the background!! The beer stands open at 10am….and it is impressive/unimpressive how much is consumed by 12 o’clock, and there is definitely a lull after lunch in the singing and banter. The lunch break is brilliant as everyone is allowed onto the field and mini games of cricket start up all over each the place, Aulden nearly took a catch of a young lad! Aulden & Rachael & Sean during the lunch break on the crowded field! The heat is something else, and the occasionally increasing breeze throughout the afternoon has been most welcome. It is quite something to watch the players, with the batsmen sticking it out at the crease, and the bowlers and fielders slogging away. A couple of dropped catches, especially Stokes! We didn’t realise that he’d then been run out as we berated the dropped catch. 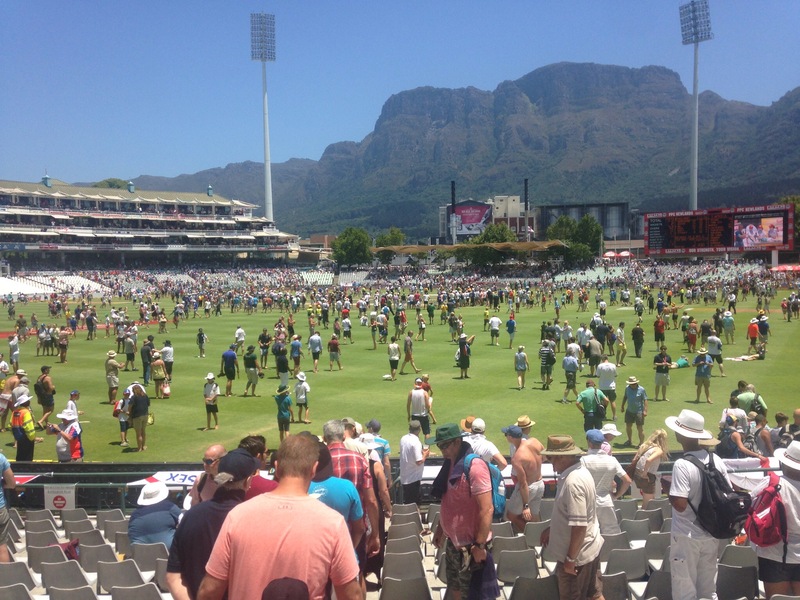 Such a fantastic day, so much action from batting to bowling, sitting sweating in the stands drinking beer and singing along with the Amla Army – or just watching them! Not south Africa’s day, but here’s hoping tomorrow is a good one and this becomes a contest of 5 days. 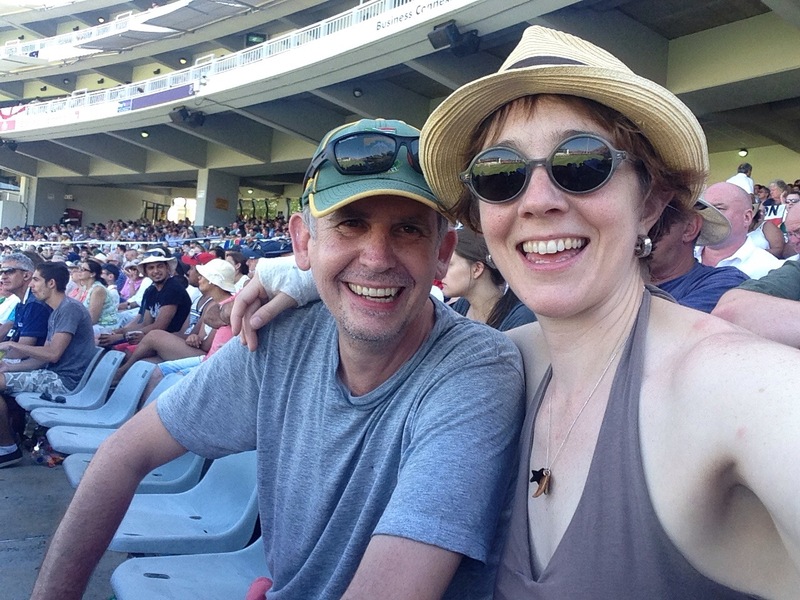 Starting the new year with…..cricket! The second reason is that whilst I had intended to go for some lovely training runs in the African sunshine, the day before I flew, on the 28th December, I was out running along my favourite Cornish coastal path and managed to slip down at steep rocky section, and broke my distal radius – aka my right wrist!! Not the best laid plan. So, I am being hosted by two of my greatest friends, favourite and most generous people here in Cape Town and for the time being unable to run. Aulden & Rachael at Kirstenbosch above. On New Year’s Eve we went to Kirstenbosch Botanical Gardens and saw Jeremy Loops sing in 2016 which was just brilliant. 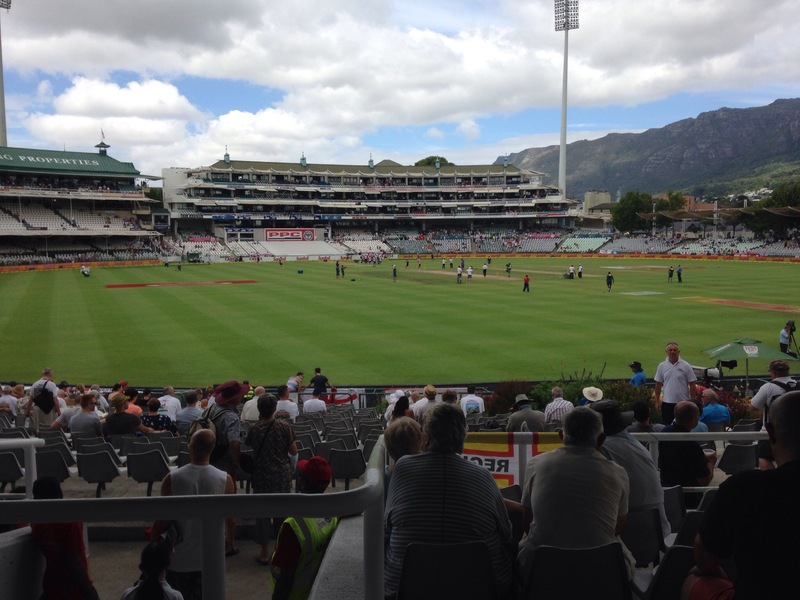 But today has been Day 1 of the Newlands Test…and oh what a day. 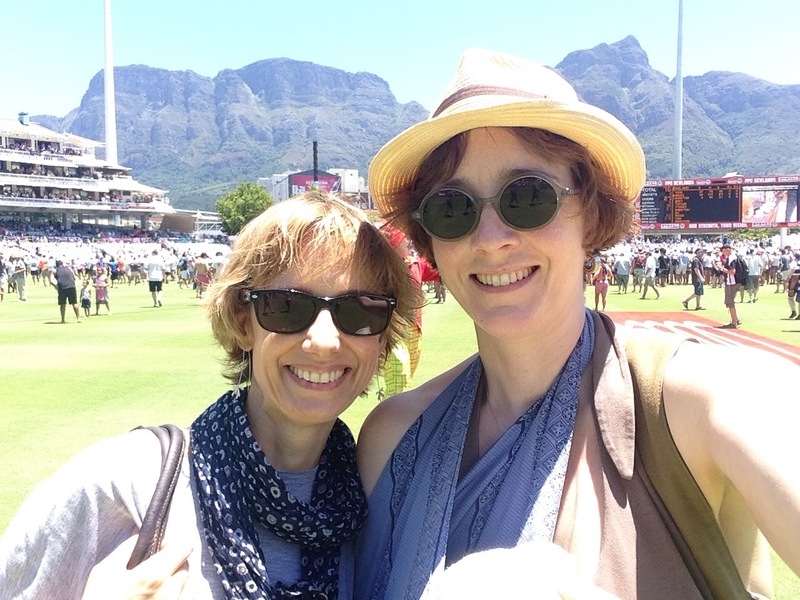 Now I have to be careful here…my friends are serious Protea supporters, and so being the only English supporter in the group I had to be respectful when we hit one of our many boundaries. 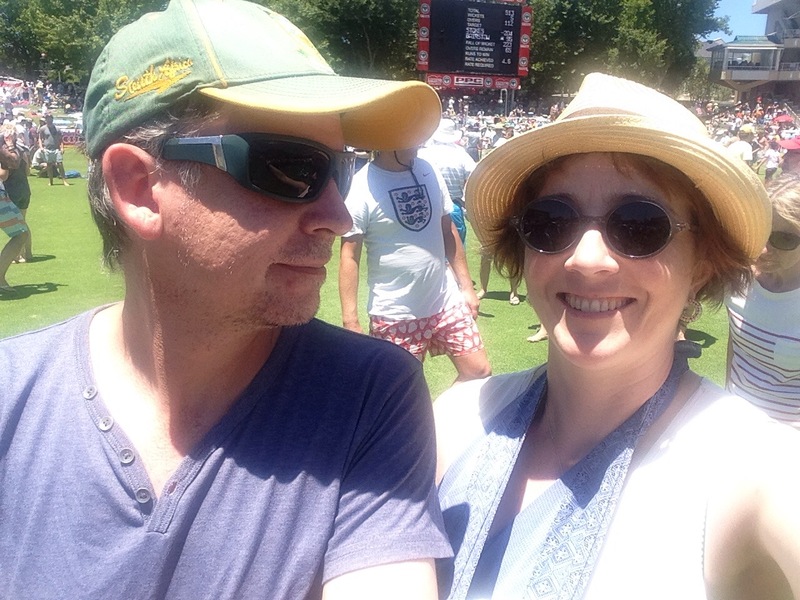 We started off on the Grass Bank underneath the Oaks by the smaller scoreboard, just in the shade for the morning. I have to admit, the catch that claimed Cook was phenomenal. 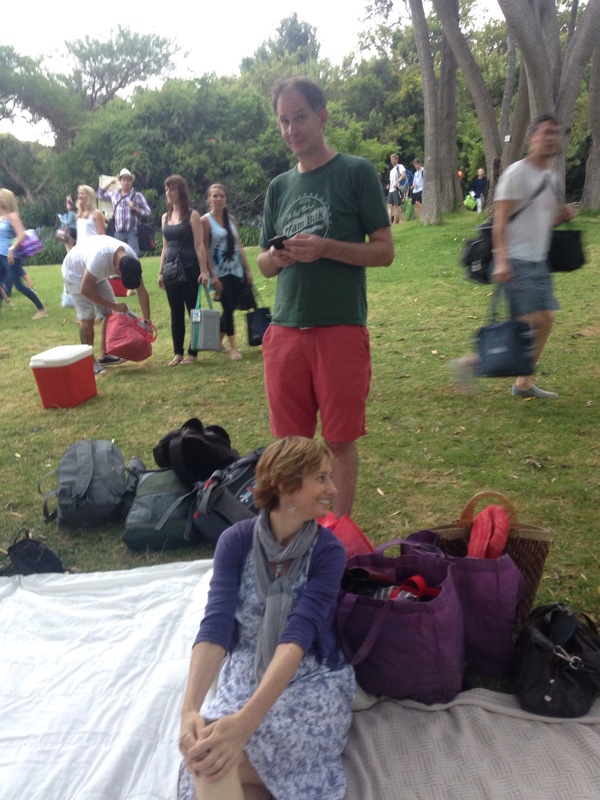 By lunchtime I was reminded of being on an Englsih beach, as there were many English fans around us who being in sunshine customarily took off most of their clothes. 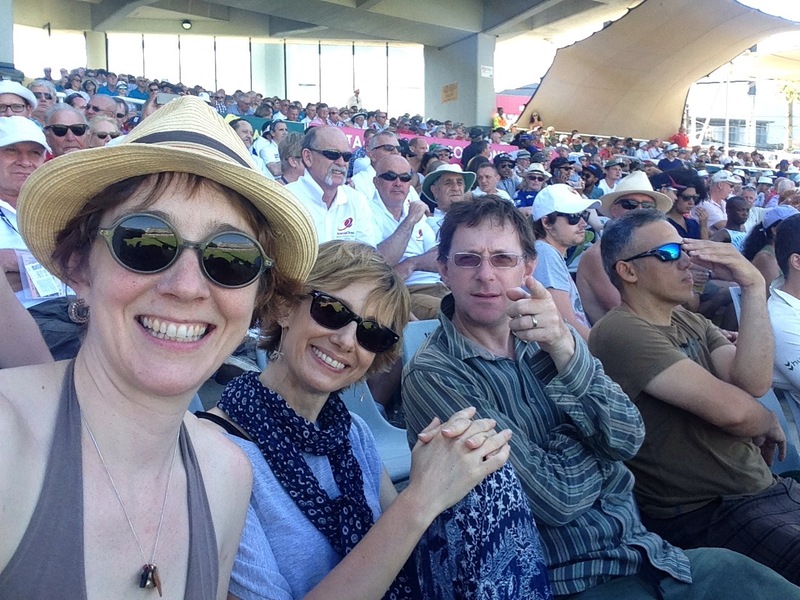 I left the leery singing to the somewhat boisterous Barmy Army – many of whom were in very good voice but also looking a little roasted by the end of the day. So hot was it at lunchtime that we sneaked out of the grounds for some lunch and fine South African wine in civilised air conditioning, but we soon rejoined the rabble, just past the president’s stand to see Root hit 50, then watch Stokes and Bairstow clobber the new ball all over the shop…I managed to get Morkel to sign my cast, but to be honest judging by his scribble it could have been anyone! 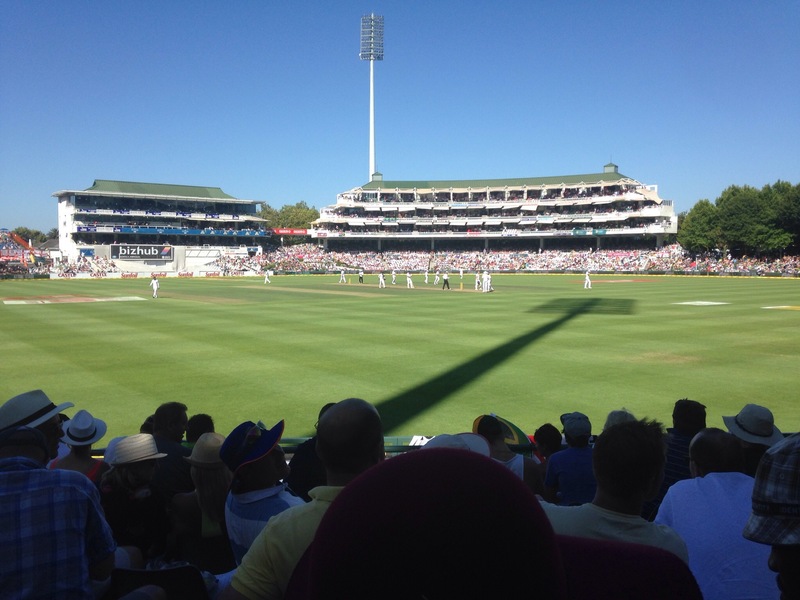 It truly was a marvellous day of Test cricket, and no doubt 4 more days will follow. As my brother Nick texted my…only 400 at least tomorrow will suffice. Rachael and myself during lunch when everyone is allowed on the field. Aulden & myself in the stands during the final session. 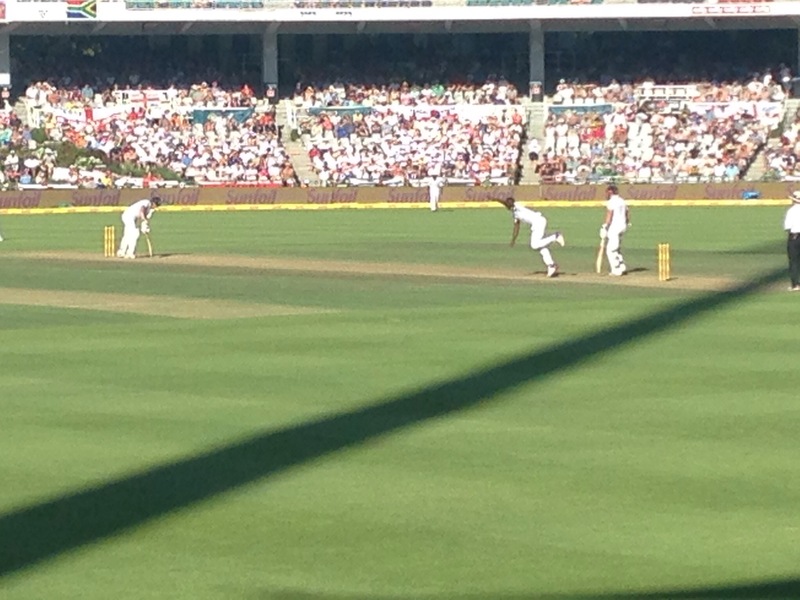 Rabada bowling a fast one to Bairstow late in the day. Myself & Rachael, Sean & Wilfred. The Newlands Pitch in all its fullness & greenness.